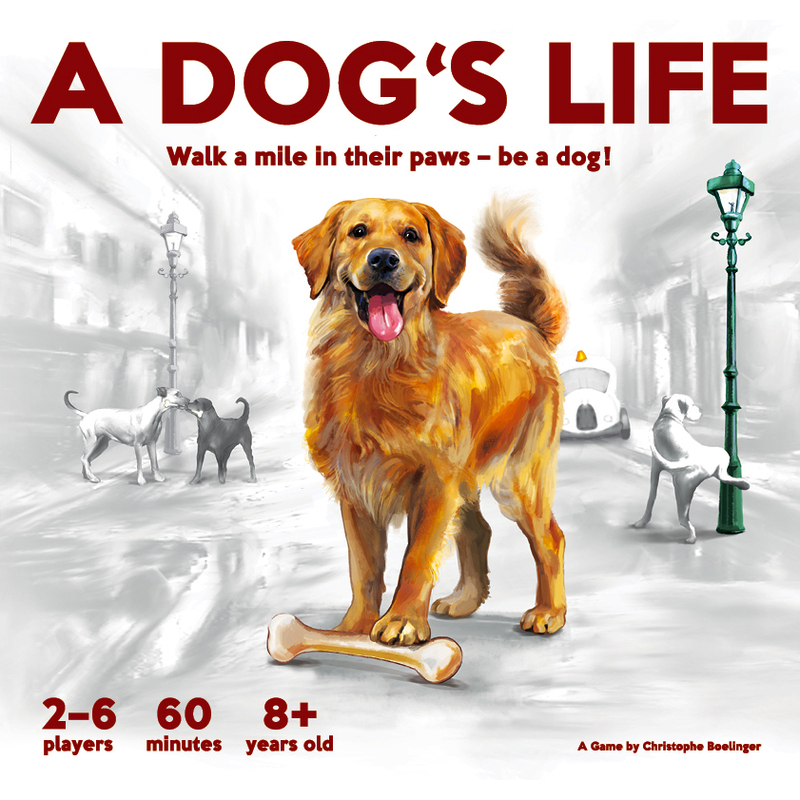 A Dog’s Life is a game by Christophe Boelinger, published by Beton Games. It is for 2-6 players. 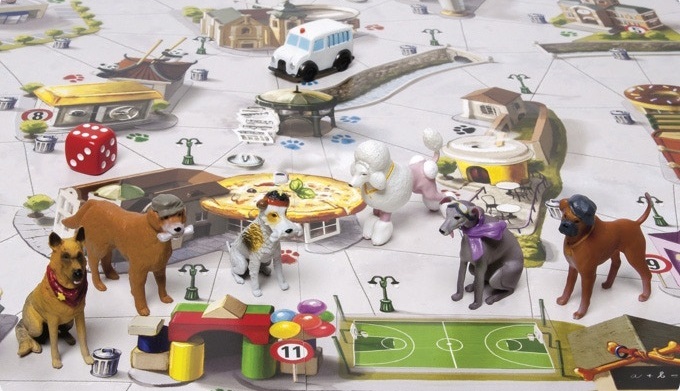 In this game, players take on the role of a dog living on the streets. They’ll be searching through trash cans, begging for scraps from the local restaurants and delivering newspapers in hopes of scoring some tasty bones. Of course they’ll have to be careful as their opponents will be trying to steal their hard earned bones. If that wasn’t bad enough they’ll need to keep a watch out for the dog catcher who’ll catch them and put them in the local shelter. In the end, the player that can best channel their inner dog and collect their bones first will be declared the winner. To begin, the board should be placed on the table. The bone and trash tokens should be placed in separate piles near the board. The newspaper tokens also should be placed in a pile, however they should be placed with the numbers on them facing down and should be mixed up pretty well. The dog catcher car should be placed on the street next to the dog shelter on the space marked with the black paw. Players should be randomly dealt a dog card and a den card, placing both of these face up in front of themselves. They should now take the corresponding dog figure and place it in the den that corresponds with the card they were given. Players should now be given a hunger counter in their color as well as the piddle counters and the 12 action cards with their dog’s picture on them. The hunger counter should be placed on the 4 space of their dog board and 1 piddle counter should be placed on a bladder space. The action cards should be shuffled together and placed face down next to the player’s dog board. The first player is chosen and play now begins. The game is played with each player taking a turn consisting of 3 phases. Those 3 phases are food, dog stuff and dog catcher. The first phase is the food phase. In this phase the player must move their hunger counter one space to the left. If the dog’s hunger counter is already in the 0 space, then the dog falls asleep and is placed on the first step of the dog shelter. More on the dog shelter in just a bit. Any bones or newspapers in it’s mouth are left in the square that it was at the beginning of the player’s turn. In this case, the player’s turn ends immediately afterwards and play passes to the next player in turn order. The other phases are skipped. The next phase is the dog stuff phase. In this phase, the player is allowed to move and perfom any of a number of actions. 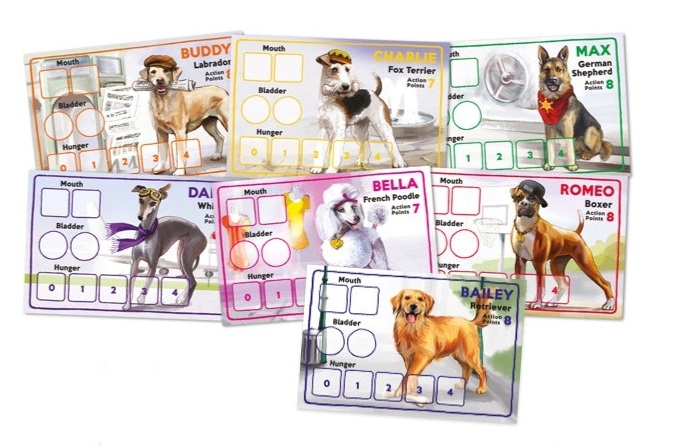 Each player’s dog card tells the number of action points that they have. Every action or movement costs 1 point. So if a player decides to move their dog 3 spaces, it will cost them 3 points. The dog can only move to squares that are adjacent to the one that it’s on. The direction the dog is pointed doesn’t matter. The dog can move in any direction. A dog can also move through a square that is occupied by another dog or the dog catcher, however it can not end it’s movement in the same square. Moving into a restaurant, newstand or delivery address must be done only through the entrance marked with the paw print and costs one action to move into the building. If a dog moves into a space with another player’s piddle token, they must immediately stop and will lose any remaining action points due to their dog sniffing the lamp post. Other than movement, there are several actions that can be taken. The dog can search a trash can if they’re in a space with an unsearched trash can. The player simply flips over their top action card and looks at the trash can section of the card to see what they found. They could find a bone, food for between 1-3 days or nothing. They then place a trash can marker on the trash can space. If a player marks the last trash can with a marker, then the “Big Cleaning” occurs. That means that any and all piddle and trash can markers are removed from the board except for the one that was just placed. The dog can also beg in a restaurant earning them a bone, food or nothing just like with the trash cans. The same process of flipping an action card is done. This time checking the restaurant section. It should be noted however that the dog can not beg at the same restaurant more than once per turn. The dog can take a newspaper from the newstand. When this is done, the player takes a newpaper token and looks at the number on the back. The token is then placed face down on the dog’s mouth space of the dog board. The number on the token indicates where the paper is to be delivered. When the dog reaches the corresponding location, the player must then show the others that the number matches with the address number. The newspaper token is then returned to the pool and the tokens shuffled. The player then flips over their top action card and checks the delivery section for a bone, food or nothing. The dog can stop and have a drink from a fountain to add a piddle token to the bladder section of their dog board. As long as the dog has a piddle token, they may mark a lamp post by placing the token in that square. This was discussed a bit earlier. It should be noted that the player may use an action at the beginning of their next turn to place a piddle token of their own which will return the previous piddle token to it’s owner. The dog can also fight another dog in an adjacent section. The dogs must be in the street though and can not be in building or den. Both attacker and defender must flip over a action card and check the fight section. The player that has the most paws on their card wins the fight. The loser drops any items in it’s mouth, including bones and newspapers. The dog must then move 1 space away from the winner. If this would place it in the same space as the dog catcher or another dog, then it moves an additional space in the same direction. If the attacker loses, then their turn is over and the next player’s turn begins skipping the next phase. If both players have the same amount of paws on their card then nothing happens, the fight is a draw. Any dropped items may be picked up as an action. It should also be noted that a dog can drop items from it’s mouth to free a space for a different item for an action as well. However, bones and newspapers may not be dropped inside a building. Once a dog is inside their den with a bone, they may bury it for an action. This keeps the bone safe as no dogs may dig it up. The last phase is the dog catcher phase. In this phase, the player must roll the die and move the dog catcher car as many squares as shown on the die. The car must move straight ahead, left or right and can not reverse or move backwards. Of course it can’t move inside buildings or dens. Once the dog catcher car stops in a square with a dog, it immediately places the dog into the dog shelter. The dog is forced to drop any bones or newspapers that it held in it’s mouth on the spot where it was caught. The dog is placed on the first space of the dog shelter. More about the shelter in just a second. If the car stop in a space adjacent to a dog, the dog tries to hide. The player must flip over an action card and check the dog catcher section to see if the dog is caught and sent to the shelter or if it escapes. Once in the shelter the dog doesn’t get hungry so it skips the first phase and can not perform any standard movements or actions. They must try to escape. To do this the player turns over their top action card and checks the escape section to see if they manage to escape or not. If they somehow escape, the dog leaves the shelter with a piddle counter and it’s hunger counter at level 4. The dog is placed on the space with the black paw on it. It will then begin it’s movement from here. If the dog was unable to escape, it’s moved to the second space of the shelter. The beginning of the player’s next turn, they will flip over 2 cards. If either of them show an escape, then the dog is able to move to the black paw square. Otherwise it’s moved to the third space of the shelter. On the player’s next turn, the dog will be placed on the black paw square without having to turn over any cards. Once the player completes this last phase of their turn, play passes to the next player in turn order. The game continues until a dog buries their third bone in their den. Once this happens the game ends and that player is the winner. This is absolutely one of the cutest looking games that I’ve seen. My daughter and I love everything about this one. The board has a really nice look and feel to it with lots of room for the various dogs to move around on. The game originally comes with 6 painted dog miniatures. These are all so adorable. Each one has a very distinct look and personality to them. Personally I’m a fan of the Fox Terrier. My daughter loves the fancy French Poodle. Each one of these dogs is made of what appears to be vinyl or resin. I’m not sure, but they’re very good quality. The same is true of the dog catcher car. Oh and did I mention they are all hand painted. That’s right, they’re already painted and look great too. The game also comes with a whole bunch of cardboard tokens. There are tokens for hunger, trash cans, bones, newspapers and piddle. Yes, there are urine counters. Ok, it’s a bit gross but it makes sense in the game. I like that the hunger counters are fully dog bowls. That’s pretty cool to me. There’s also a die and a bunch of cards too. Each dog has their very own deck of action cards with their picture on the back. No need to worry about losing your cards. Just check the back and you know which ones are yours. There are also card for each of the different dens for assigning a player’s starting location. Finally there are the dog boards. I love these. Each one has a different dog design that, like the miniatures, shows off the dog’s personality. Everything about this game is high quality. The artwork is really cool and looks amazing. My daughter and I both love love love these components. It’s definitely her favorite game as far as components go. The rulebook for this game is well designed. Every rule is covered in great detail as are all the different phases and actions. There are lots and lots of pictures and examples of gameplay. The action cards are explained quite well and how they pertain to each of the different actions that use them. The rules also have a great section full of game variations for extending the game, experienced players and even 2 variants for using more than 1 dog. There’s a great page that give a little story of the different dogs in their own words. Once again, this shows off the dog’s personality. The rules include game tips as well as a section that explains things about an actual dog’s life. Things like why dogs bury bones and explains about dog shelters. Everything is very easy to read through and understand. There’s nothing that I found that should give players any kind of trouble. The book is well written and looks great too. Overall a great job. This is a really cute and fun game. Even though I’ve yet to win a game, I enjoy it. That’s right, my daughter has won every time we’ve played. Either through luck or skill, I don’t know. She’s magical like that. In any case, the game has a lot to like about it. It’s not a roll and move game like Candyland or some other kid’s game and it’s not a matching game like Memory. What it does it gives you several actions that you can take and then gives you the ability to do pretty much whatever you want to do. Kind of like a real dog. Hmm…I’m wondering if that was the plan here. Anyway, you’ll be moving your little dog around the board, knocking over trash cans, begging on the steps of those fancy restaurants and delivering newspapers. All in hopes of bringing home those tasty bones. You’ll have to be careful as your opponents are going to turn that dog catcher car right in your direction, so you have to make sure that you keep a good safe distance from that thing. Don’t want to end up in the slammer. Even though it’s kind of gross when you think about it, I like that you can piddle on the lamp posts to keep other dogs from moving ahead too far or for covering your tail. If you have a bone in your mouth, you don’t want to end up having to fight to keep it. Yes, this game has a good deal of luck and sometimes you can end up with a runaway winner. That’s happened several times with us. My daughter would get 3 bones before I was even able to bury 1. My wife even enjoyed playing the game and she’s doesn’t like very many games. It’s simple enough that kids can play, yet fun enough to keep the adults entertained too. It’s a great family game that everyone can enjoy, from the little kids to even grandma and grandpa. Thematically it’s pretty solid. You get that feeling that you’re a dog, roaming around the city doing what dogs do best. It’s not a strategic game and it’s not going to melt your brain with too many decisions to make. It will entertain you and your kids. If you’ve ever wanted to know what it felt like to be a dog, then I think you’ll enjoy this game. Kids will love it. I highly recommend it for families with kids, especially young kids. My daughter and I love this one and can’t help but want to play it more and more. A Dog’s Life is a family friendly game about what it feels like to be a dog for a day. It’s not a really long game to play. Most games take about 30 minutes or so to play. The components are very high quality and the artwork is amazing. My daughter and I love everything about the game from the dog miniatures to the dog boards and the cards. Everything is very thematic and gives you plenty of choices to make. You also have the freedom to do whatever you feel. If you want to try your hand at delivering newspapers, have at it. If you think knocking over trash cans is the way to go, then do that. There is no wrong answer. The game is very easy to teach and is great for playing with the kids and family. My family loves this one. It’s a game that the kids will enjoy and that the adults will have fun with too. I highly recommend this one for families with young kids. It’s a great game that we love to play. I’d say that the designer dug up a winner with this game. No bones about it. For more information, you can check out the game’s site below. A Dog’s Life is available right now for backing on Kickstarter. Just follow the link below and you can get your own copy. This entry was posted in Reviews and tagged a dog's life, beton, beton games, board, board games, boelinger, card, card games, christophe, Christophe Boelinger, dog, dogs, games, life. Bookmark the permalink.